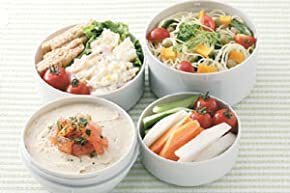 Whether in the office or on the go, you can take a healthier, tastier, more interesting lunch with you thanks to Zojirushi’s Mr. Bento Stainless Lunch Jar. One of the most versatile lunch boxes you’ll ever come across, the Mr. Bento lunch jar comes with four different containers that allow you to pack a multi-course lunch of both hot and cold items easily and securely. The jar itself is made of stainless steel, is vacuum-insulated and houses four plastic containers with lids. 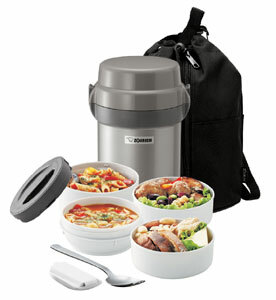 The large soup bowl comes with gasket-sealed lid to prevent messy spills and is specially insulated to keep soup hot. All pieces should be washed by hand with non-abrasive cleaning pads. Inner bowls are microwave-safe. A spork with its own protective cover attaches to the Mr. Bento lunch jar, and the jar itself has its own lid with lock and comes in a zippered carry bag with a strap for easy transport. The Mr. Bento comes with two side bowls, one large 10.1-ounce and one small 6.8-ounce, that sit inside the lid. They are ideal for foods that should be kept room temperature, such as chips, nuts or snacks. The side bowls are not insulated. The 15.2-ounce main bowl is designed to hold the main course. 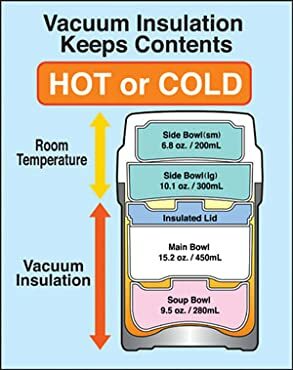 The outer container’s vacuum insulation and the insulated lid of the main bowl help keep foods hot or cold for hours without reheating or refrigeration. The 9-1/2-ounce soup bowl has a unique lid that minimizes leaks and is ideal for holding soups, dips, or fruit cocktail. It sits at the bottom of the outer container, where vacuum insulation keeps the foods hot or cold for hours. How does it keep food hot or cold? With Zojirushi’s renowned vacuum insulation technology, air between the two thin layers of stainless steel on the outer container is removed, creating a vacuum. Because there is no air, the temperature on the outside does not transfer into the container; keeping foods hot or cold for hours. 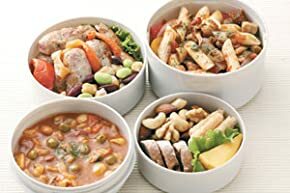 Zippered carrying bag with strap; outer container with lock and lid; 6.8-ounce small side bowl with lid; 10.1-ounce large side bowl with lid; 15.2-ounce main bowl with lid; 9-1/2-ounce soup bowl with gasket, valve, and lid; forked spoon with cover and holder.